Do you want more energy? Does your body need a detox? Do you want to protect yourself from getting a cold? Do you want a drink that tastes great and has tons of beneficial vitamins and minerals that your body needs? Or do you just want a new way to use you Nutri Ninja, but aren’t sure where to start? 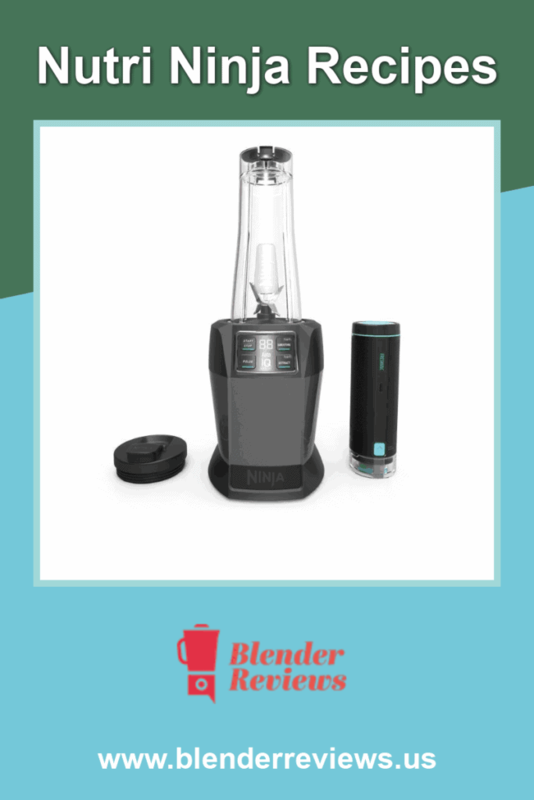 Whatever the purpose you have in mind for your smoothie, juice drink, or slimming diet concoction, there is a Nutri Ninja Recipe just for you. Your body will love the nutrition and your blender will love the attention. That’s what we call a win-win. Check out these twenty-one delicious health boosting bad boys below, each named according to the health benefits they provide. What makes a smoothie a smoothie? The addition of milk, yogurt, or ice cream along with pureed fruit gives a smoothie its signature thick, smooth, tasty essence. You can even add vegetables to your smoothies. Their taste can be masked, if you so choose, and you still get all the benefits as if you ate the veggies on their own. Parents, heed my advice. Have stomach trouble? Indigestion, heartburn, and nausea are no match for this smoothie. How, you ask? We’ve included fresh ginger in our recipe because it is a natural remedy for these types of ailments. Blend until smooth, pour, and enjoy! Two servings per recipe. Per serving, you get 157 calories, 1 gram of fat, 0.8 grams of saturated fat, 57 milligrams of sodium, 34 grams of carbohydrates, 38 grams of sugar, 1.5 grams of fiber, and 5 grams of protein. For less sugar, substitute plain yogurt for vanilla yogurt. Your workout regimen requires a lot of energy from you, and we know how important it is to refuel when your energy supply is depleted. That’s why we’ve created this smoothie. So you can cool down with its low-calorie citrus filled frothiness. Blend until smooth, pour, and enjoy! One serving per recipe. Per serving, you get 160 calories, 3 grams of protein, 36 grams of carbohydrates, 3 grams of fiber, 28 grams of sugar, 1 gram of fat, 0.5 grams of saturated fat, and 60 milligrams of sodium. Your brain is one big muscle that needs the correct fuel to function at an optimal level. This smoothie uses the ancient Chinese herb, ginkgo, which has been known to improve cognitive function and prevent memory loss, not to mention all the healthy fats and protein. Talk about a big brain boost! Per serving, you get 350 calories, 15 grams of fat, 4.5 grams of saturated fat, 9 grams of protein, 31.5 grams of sugar, 10.1 grams of fiber, 56.5 grams of carbohydrates, and 81 milligrams of sodium. One more thing to note is that is has about 393.8 milligrams of Potassium and almost 50% Daily Value of Vitamin C.
Having cravings for something sweet and decadent, but don’t want to indulge yourself with too much fat and sugar? This fantastically frothy smoothie recipe can and will do the trick. See for yourself! Whip until smooth, pour, and enjoy! One serving per recipe. Per serving, you get 283 calories, 3.5 grams of fat, 2 grams of saturated fat, 167 milligrams of sodium, 53.5 grams of carbohydrates, 48 grams of sugar, 2 grams of fiber, and 13 grams of protein. This Nutri Ninja Smoothie Recipe packs a satiating and disease fighting fiber punch. Make it even healthier when you use organic kiwis, which contain higher levels of heart-healthy polyphenols and vitamin C.
Blend until smooth, pour, and enjoy! Four servings per recipe. Per serving, you get 87 calories, 0.3 grams of fat, 0 grams of saturated fat, 3.5 milligrams of sodium, 22 grams of carbohydrates, 16.5 grams of sugar, 1.5 grams of fiber, and 0.5 grams of protein. Workouts require a lot of energy. Restore your energy levels in minutes with this smoothie so you can get the most out of your workout. For an extra dose of calcium, try adding a teaspoon of organic kale powder. Per serving, you get 162.5 calories, 1 gram of fat, 0.1 gram of saturated fat, 5 milligrams of sodium, 41.5 grams of carbohydrates, 32 grams of sugar, 6 grams of fiber, and 2 grams of protein. 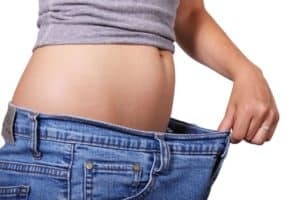 Trying to eliminate processed sugar from your diet? Look no further. This smoothie only uses natural sugar from the strawberries to sweeten it. That’s right, no added sugars. Optional: Enjoy with either 1 tablespoon sunflower or pumpkin seeds. One serving per recipe. Per serving, you get 256 calories, 14 grams of fat, 1.5 grams of saturated fat, 106 milligrams of sodium, 26 grams of carbohydrates, 19 grams of sugar, 3 grams of fiber, and 9 grams of protein. 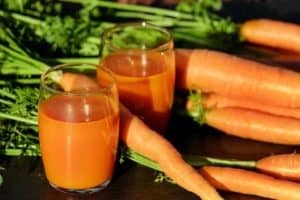 What is a juicer recipe? 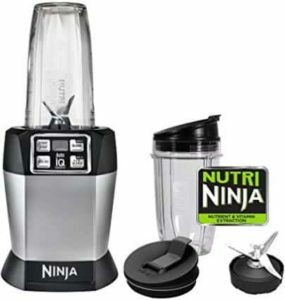 A juicer recipe uses the abilities of a juicer machine, like the Nutri Ninja, to extract juice from fruit and vegetables that you drink like a juice. 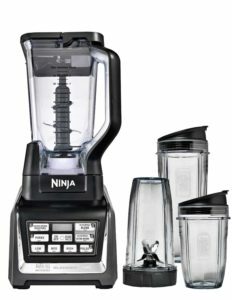 Take a look at the Ninja Juicer Recipes we’ve selected below. They’ll be sure to satisfy your tastebuds. As a side note, if you want to convert any of the following recipes to a smoothie instead, the process to do so is very simple. Just combine one cup of the fruit or vegetable juice from any recipe, one cup of ice cubes, half a cup of yogurt, and one medium peeled banana in a blender. Blend until you’ve reached the desired consistency and enjoy your juice turned smoothie. 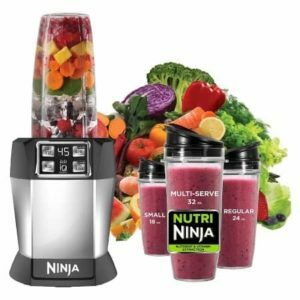 This Ninja Juicer Recipe sneaks in enough greens to get a healthy dose of iron, which is required for healthy blood cell and muscle function. And to support bone and blood health, it also gives you more than your daily recommended intake of vitamin K.
Blend, scraping down sides occasionally, until smooth. Strain juice and, if desired, thin with additional water. Refrigerate up to 2 days (shake before serving). Two servings per recipe. Per serving, you get 110 calories, 0.6 grams of fat, 0.1 gram of saturated fat, 3 grams of protein, 27 grams of carbohydrates, 3 grams of fiber, and 19 milligrams of sodium. This vitamin powerhouse (A, B, C, E) fuels your whole body. It even boasts anti-aging properties. But what is most interesting is its supply of Lutein plus vitamins A and C up collagen production. This means strong bones and younger-looking skin. Blend, scraping down sides occasionally, until smooth. Strain juice and, if desired, thin with water. Refrigerate up to 2 days (shake before serving). Two servings per recipe. Per serving, you get 192 calories, 0.4 grams of fat, 0 grams of saturated fat, 1 gram of protein, 51 grams of carbohydrates, 8 grams of fiber, and 2 milligrams of sodium. Berries are known for their potent antioxidant content, and among other things, anti-aging properties are a side effect of those antioxidants. Per serving, you get 151 calories, 1 grams of fat, 0.2 grams of saturated fat, 2 grams of protein, 38 grams of carbohydrates, 5 grams of fiber, and 3 milligrams of sodium. Need an instant boost? The natural sugars found in the fruits of this drink will give you the energy you need. And to keep you hydrated, we’ve included electrolyte-dense coconut water. Per serving, you get 105 calories, 0.6 grams of fat, 0.2 grams of saturated fat, 2 grams of protein, 26 grams of carbohydrates, 3 grams of fiber, and 95 milligrams of sodium. Want some extra protection against colds? The combination of kiwi and other citrus fruits in this juice will supply over twice of your daily recommended vitamin C intake. Per serving, your get 156 calories, 1 gram of fat, 0.2 grams of saturated fat, 3 grams of protein, 38 grams of carbohydrates, 6 grams of fiber, and 5 milligrams of sodium. The protein found in almonds helps to build and repair muscle tissue. That’s why we’ve added it into this Ninja Juicer Recipe. Plus, the potassium found in the sweet potatoes balances your electrolytes and fluids after a workout. Per serving, you get 231 calories, 9.1 grams of fat, 0.7 grams of saturated fat, 6 grams of protein, 36 grams of carbohydrates, 7 grams of fiber, and 24 milligrams of sodium. The high-fiber root veggies and fruits found in this recipe keep your digestive tract functioning as it should. The ginger is added to calm your stomach. Per serving, you get 155 calories, 0.7 grams of fat, 0.1 grams of saturated fat, 3 grams of protein, 37 grams of carbohydrates, 8 grams of fiber, and 168 milligrams of sodium. So you want to slim down and you want to use your Nutri Ninja to do it. Well, you’re in luck. We’ve got some Nutri Ninja Slim Recipes that will fit perfectly into your diet. Better yet, they taste phenomenal. Fat-free vanilla ice cream makes this protein packed smoothie sinful and slimming. Skip the “spoonful of sugar” Mary Poppins recommends and choose this for a healthier option. Blend until smooth, pour and enjoy! For a thicker shake, add more ice cubes. Two servings per recipe. Per serving you get 150 calories, 2 grams of fat, 1 gram of saturated fat, 73 milligrams of sodium, 26.5 grams of carbohydrates, 24 grams of sugar, 2 grams of fiber, and 9 grams of protein. Craving an ice cold milkshake or a nice big bowl of ice cream, but don’t want to ruin your diet? You won’t have to sacrifice your waistline or your cravings with this healthy, thick, and tasty smoothy. Pulse for 30 seconds, blend until smooth, pour and enjoy! One serving per recipe. Per serving, you get 185 calories, 2 grams of fat, 1 gram of saturated fat, 90 milligrams of sodium, 35 grams of carbohydrates, 26 grams of sugar, 3.5 grams of fiber, and 8 grams of protein. This health drink uses two natural diuretics, parsley and beets, to help to get rid of any excess fluids lingering in your body. Bye bye bloat! Per serving, you get 138.5 calories, 0.6 grams of fat, 0.1 grams of saturated fat, 98.5 milligrams of sodium, 8.1 grams of fiber, 35.6 grams of carbohydrates, 23.7 grams of sugar, and 2.6 grams of protein. Fight fat with the dark leafy greens in this recipe. These green goodies are high in calcium, which is associate with weight loss. As for the ginger? Well, it may help to keep you satiated for longer. Per serving, you get 94 calories, 0.9 grams of fat, 0.1 grams of saturated fat, 140.2 milligrams of sodium, 20.3 grams of carbohydrates, 6.6 grams of fiber, 3.4 grams of sugar, and 6.2 grams of protein. Coconut oil is made up of medium-chain fatty acids that help to speed up your metabolism. That means you burn more calories per day, which is why you’ll find it in this smoothie. It also makes you feel fuller for longer. Per serving, you get 132.3 calories, 3.9 grams of fat, 2.0 grams of saturated fat, 76 milligrams of sodium, 25.3 grams of carbohydrates, 3.0 grams of fiber, 19.9 grams of sugar, and 1.6 grams of protein. This Nutri Ninja Slim Recipe has two sources of protein–avocado and hemp seeds. Raw cocoa nibs and wheatgrass are two great sources of magnesium, a chemical element that is essential for a good night’s sleep. If you are one of the many people suffering from any sort of sleeping disorder, try this natural remedy first. Blend until smooth, adding a little more liquid if necessary. Pour and enjoy! Two servings per recipe. Per serving, you get 183.8 calories, 9.8 grams of fat, 3.9 grams of saturated fat, 35 milligrams of sodium, 25 grams of carbohydrates, 4.3 grams of fiber, 15.5 grams of sugar, and 3.3 grams of protein. Ever find it difficult to make it to lunchtime without bingeing on some snacks? This smoothie, eaten at breakfast, keeps you satisfied right up until lunch. Per serving you get 300 calories, 14 grams of protein, 63 grams of carbohydrates, 5 grams of fiber, 45 grams of sugar, 0.5 grams of fat, 0 grams of saturated fat, and 180 milligrams of sodium.